LISENDO880 - Ultrasound System - Product - The Industrial Promoting Co. Ltd.
[Attaining the next level of image quality] A wide range of essential image adjustment parameters dedicated to optimizing cardiac image quality; a variety of technologies to reduce confounding factors that inhibit signal fidelity such as patient dependent variability; transducers, image processing algorithms, monitor display: Hitachi has further refined technologies at every level for LISENDO 880. 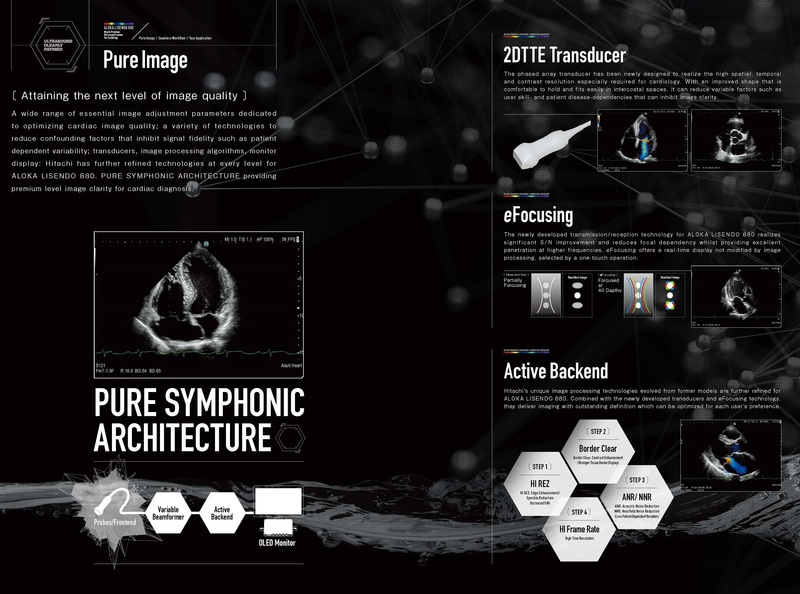 PURE SYMPHONIC ARCHITECTURE providing premium level image clarity for cardiac diagnosis. 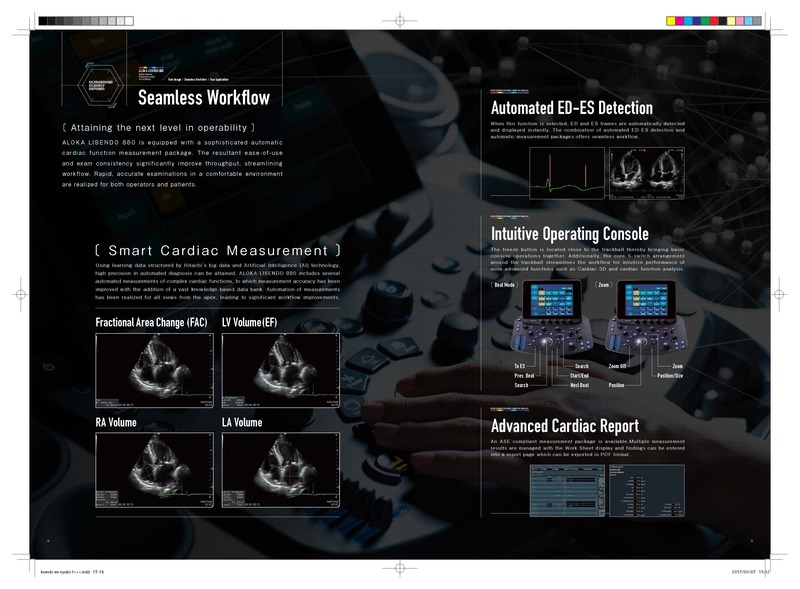 2DTTE Transducer The phased array transducer has been newly designed to realize the high spatial, temporal and contrast resolution especially required for cardiology. With an improved shape that is comfortable to hold and fits easily in intercostal spaces, it can reduce variable factors such as user skill- and patient disease-dependencies that can inhibit image clarity. eFocusing The newly developed transmission/reception technology for LISENDO 880 realizes significant S/N improvement and reduces focal dependency whilst providing excellent penetration at higher frequencies. eFocusing offers a real-time display not modified by image processing, selected by a one-touch operation. Active Backend Hitachi's unique image processing technologies evolved from former models are further refined for LISENDO 880. Combined with the newly developed transducers and eFocusing technology, they deliver imaging with outstanding definition which can be optimized for each user's preference. 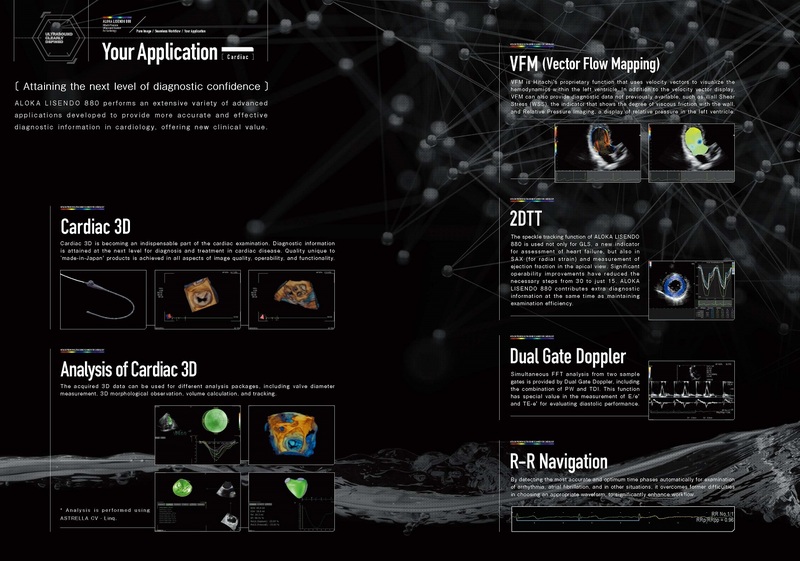 A wide range of essential image adjustment parameters dedicated to optimizing cardiac image quality; a variety of technologies to reduce confounding factors that inhibit signal fidelity such as patient dependent variability; transducers, image processing algorithms, monitor display: Hitachi has further refined technologies at every level for LISENDO 880. 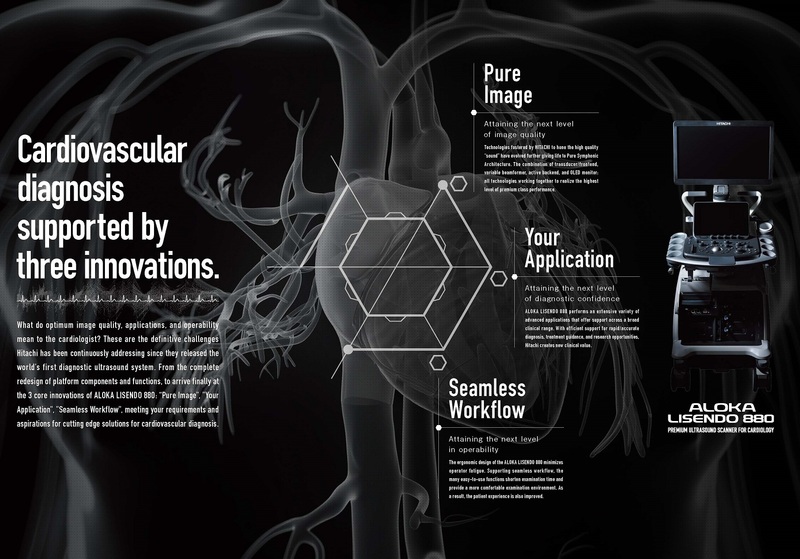 PURE SYMPHONIC ARCHITECTURE providing premium level image clarity for cardiac diagnosis. 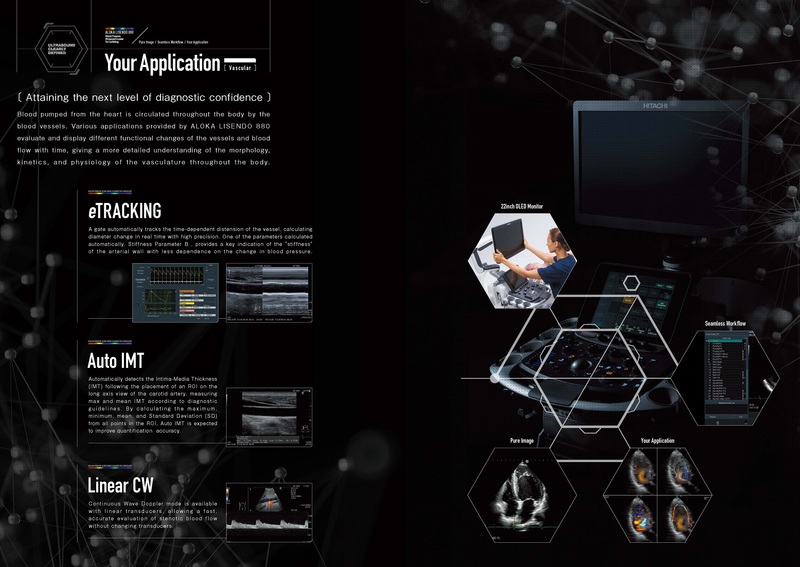 The phased array transducer has been newly designed to realize the high spatial, temporal and contrast resolution especially required for cardiology. With an improved shape that is comfortable to hold and fits easily in intercostal spaces, it can reduce variable factors such as user skill- and patient disease-dependencies that can inhibit image clarity. The newly developed transmission/reception technology for LISENDO 880 realizes significant S/N improvement and reduces focal dependency whilst providing excellent penetration at higher frequencies. eFocusing offers a real-time display not modified by image processing, selected by a one-touch operation. Hitachi's unique image processing technologies evolved from former models are further refined for LISENDO 880. Combined with the newly developed transducers and eFocusing technology, they deliver imaging with outstanding definition which can be optimized for each user's preference. Blood pumped from the heart is circulated throughout the body by the blood vessels. Various applications provided by LISENDO 880 evaluate and display different functional changes of the vessels and blood flow with time, giving a more detailed understanding of the morphology, kinetics, and physiology of the vasculature throughout the body. Cardiac 3D is becoming an indispensable part of the cardiac examination. Diagnostic information is attained at the next level for diagnosis and treatment in cardiac disease. Quality unique to 'made-in-Japan' products is achieved in all aspects of image quality, operability, and functionality. The acquired 3D data can be used for different analysis packages, including valve diameter measurement, 3D morphological observation, volume calculation, and tracking. ※ Analysis is performed using ASTRELLA CV - Linq. With a globally aging population, the diagnosis and management of heart failure has become very important. Ultrasound examination of patients with heart failure and arrhythmia must be provided with the utmost efficiency and accuracy. 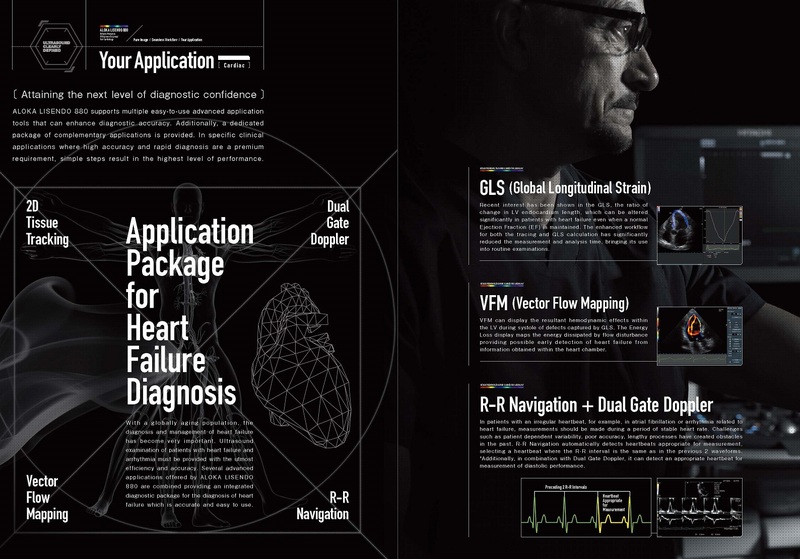 Several advanced applications offered by LISENDO 880 are combined providing an integrated diagnostic package for the diagnosis of heart failure which is accurate and easy to use. Recent interest has been shown in the GLS, the ratio of change in LV endocardium length, which can be altered significantly in patients with heart failure even when a normal Ejection Fraction (EF) is maintained. The enhanced workflow for both the tracing and GLS calculation has significantly reduced the measurement and analysis time, bringing its use into routine examinations. VFM can display the resultant hemodynamic effects within the LV during systole of defects captured by GLS. The Energy Loss display maps the energy dissipated by flow disturbance providing possible early detection of heart failure from information obtained within the heart chamber. In patients with an irregular heartbeat, for example, in atrial fibrillation or arrhythmia related to heart failure, measurements should be made during a period of stable heart rate. Challenges such as patient dependent variability, poor accuracy, lengthy processes have created obstacles in the past. R-R Navigation automatically detects heartbeats appropriate for measurement, selecting a heartbeat where the R-R interval is the same as in the previous 2 waveforms. ※ Additionally, in combination with Dual Gate Doppler, it can detect an appropriate heartbeat for measurement of diastolic performance. Automatically detects the Intima-Media Thickness (IMT) following the placement of an ROI on the long axis view of the carotid artery, measuring max and mean IMT according to diagnostic guidelines. By calculating the maximum, minimum, mean, and Standard Deviation (SD) from all points in the ROI, Auto IMT is expected to improve quantification accuracy.